The $17.5 billion loan approved by the IMF won’t save Ukraine from hopeless poverty; instead, it will inflict a blow on the country’s population already living on the breadline, said the ex-head of the National Bank of Ukraine Sergei Arbuzov. None of the options proposed by the IMF would improve the economy, said Arbuzov to Izvestia, adding that the biggest mistake made by the government was working with the IMF instead of working with the economy. The IMF loan will only partly solve the short-term problems of Ukraine, and won’t level the global imbalances. The payments on public debt will be about $11 billion in 2015. That means all of the money received from the IMF, except a few billion for supporting the exchange rate will be used to pay foreign debts. But the payment of foreign debt would in no way become an incentive for attracting investment into Ukraine, Arbuzov said. “Will it solve the problems of Ukraine, which is de facto only refinancing debt? Definitely no. As a result, the debt will become even larger,” he said. “What did the government set up social experiments on the population for? The paradox is that for anything but for the sake of the population itself,” he said, adding that now is the time for average people to pay for the Ukrainian government’s mistakes. The real income of the Ukrainian population is already on the brink, with many living below the poverty line. The government will soon face the choice of whether to refuse granting some people with subsidies, and thus raising social discontent, or to resort to printing money, causing another round of inflation, Arbuzov suggests. Cuts in pension payments, social services and health care, as well as the reduction in the Naftogaz deficit by higher prices for gas and utility services were among the terms for providing financial aid to Ukraine. Arbuzov says raising tariffs could only theoretically solve the problem of Naftogaz, as the scale of the deficit won’t let Ukraine raise the overall standard of living. The increase in tariffs makes it possible to leave everything as an inefficient and non-transparent system; it’s easier to keep afloat especially at the expense of ordinary citizens. “And this applies not only to Naftogaz,” he added. “Time has already shown what we were talking about a year and a half ago: The European market has no need for Ukraine. 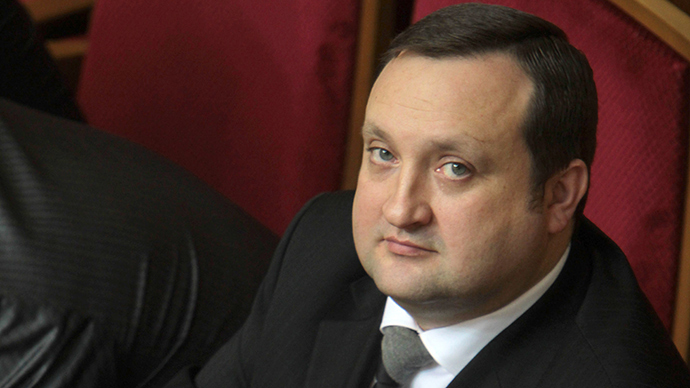 Last year, despite the favorable terms of the EU, our exports there grew only by 1.5 percent,” said Arbuzov. China, for example, is willing to invest in real Ukrainian projects, he said recalling the agreements signed by the two countries. Talking about the latest IMF decision on Ukraine, one shouldn’t forget the example of Greece that agreed to receive loans from lenders with multiple cuts in expenditure and no adequate structural reforms. As a result, Greece plunged into a deep economic crisis caused by austerity measures and is unable to pay off its debts totaling €246 billion. The country’s GDP has slumped a quarter to €242 billion. A third of Greeks live below the poverty line and the unemployment rate has reached 30 percent. The IMF agreed to provide Ukraine with $17.5 billion in financial aid within the next four years. The total amount of money to be granted to Ukraine from all other foreign creditors is expected to be up to $40 billion. The fund’s decision will help the country avoid default as it has nothing to pay the current debts with. The government hopes that other international lenders will later join the IMF and assist Ukraine in overcoming the crisis. However, the success will depend on how the country’s authorities carry out the painful economic reforms requested by the IMF.